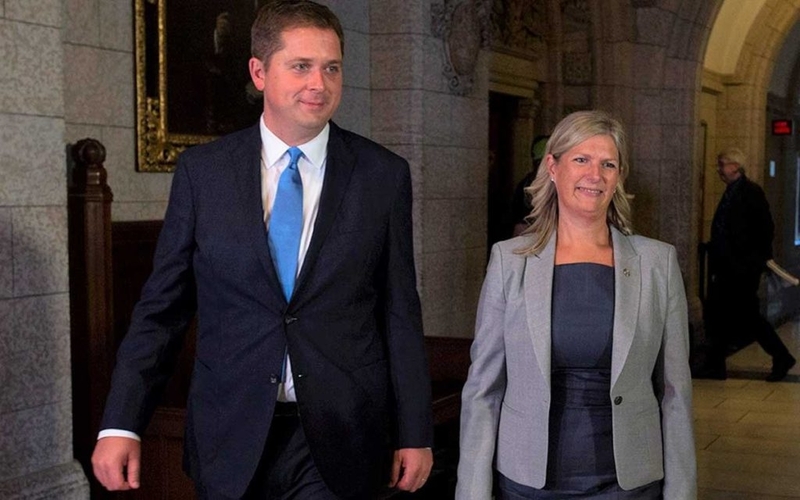 The Niagara Independent, September 21, 2018 – Aurora-Oak Ridges-Richmond Hill MP Leona Alleslev surprised everyone on the first day of the Fall Session of Parliament, rising in her place on the government backbenches to announce that she will “cross the floor” to join the Conservative party caucus. It is remarkable that a MP would leave a government caucus to sit with an opposition caucus. However, what is most startling is what this rookie MP had to say about her Liberal colleagues’ abilities to manage the affairs of the country. Her assessment of the state of Canada was both focused and sobering. “We find ourselves in a time of unprecedented global instability. We see fundamental shifts in the global economy, while trade relationships, international agreements and defence structures are under threat. “Here at home, we see large amounts of capital investment leaving Canada while tax structures, federal infrastructure problems and politics prevent us from getting goods to market, deter companies from expanding, and undermine competitiveness. Though many Canadians did not know rookie MP Leona Alleslev before Monday, she is a very talented and intelligent individual. Ms. Allesley is a graduate of Royal Military College, served as a logistics officer in the Royal Canadian Air Force and retired from our Canadian Forces with the rank of captain. After her service, she worked in the Department of National Defence and also held senior management roles with both IBM and Bombardier. Given this background, and given the three years she has spent in the government caucus being fully briefed on Canada’s response to on-going global affairs, her comments ring true as a dire warning. As a former business owner, she is critical of the government’s small business tax changes introduced last year. As a former Air Force officer, she is now speaking out about the government’s decision to buy used fighter jets. On domestic affairs, she is now openly critical of PM Justin Trudeau’s agenda to help middle-class Canadians. In the wake of the announcement, shocked Liberals frantically counterspun their former caucus colleague’s warnings by impugning alternative political motives. Some Liberals suggested the MP smelled the electoral wind in Aurora and Richmond Hill and switched teams in an attempt to win again. There were private emails leaked between senior Minister Christina Freeland and MP Allesley that were praising the PM and government efforts as late as July. Liberal-friendly media, like CBC and The Toronto Star, abetted this counterspin with lead reports on the PMs’ summer visit to the MP’s riding and Allesley’s gushing praise for her then-boss – and then featuring anonymous inside sources saying she was discouraged by being passed over for a Parliamentary Secretary appointment by the PM. 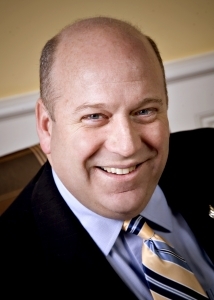 Chris George is an Ottawa-based government affairs advisor and wordsmith, president of CG&A COMMUNICATIONS. 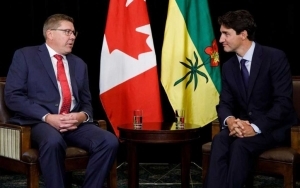 Saskatchewan Premier Scott Moe and Prime Minister Justin Trudeau talk in Saskatoon. 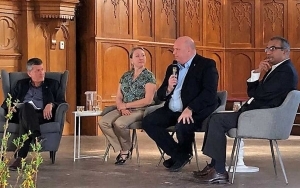 The Niagara Independent, September 14, 2018 – This week, the Liberal Caucus met in Saskatoon, Saskatchewan while the NDP Caucus hunkered down in Surrey BC. News out of both federal caucuses revealed that the MPs have been given their election scripts to begin their long march towards the 2019 vote. The two caucuses met with a backdrop of contentious Canadian news items dominating the national conscience. Canadians are pre-occupied with the faltering NAFTA negotiations, the fate of the recently nationalized TransMountain pipeline project, the strong provincial opposition that has risen against Ottawa’s planned carbon tax plan, and the seemingly lack of controlling the flow of irregular migrants crossing our Canadian borders. In addressing the current trade discussions with the Americans, PM Justin Trudeau expressed optimism as he praised the efforts of his trade minister: “We’ve always been constructive, ready to work hard around the NAFTA table. Minister Freeland is right now down in the United States, she’s had good discussions, continues to do it…. Chrystia, every day you are standing up for Canadian workers, defending our interests and working tirelessly to get us to a deal that is good for Canadians and good for Canada,” the PM said. 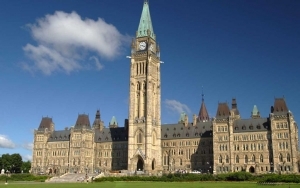 In the coming weeks, Canadians can expect to hear more combative electioneering rhetoric as MPs return to Ottawa to open the Fall Parliamentary Session on Monday. The Niagara Independent, September 7, 2018 – Headline news from the Nation’s Capital through the summer focused on the fate of NAFTA and the evolving asylum seekers-border issues. A vast majority of Canadians enjoying their summer escapes likely missed any other federal news. Here are 6 news items (in no particular order) from the month of August that should not pass unnoticed for those interested in the developing stories of our federal government. First, Canada started its year-long UN peacekeeping mission in Mali on August 1st. The Prime Minister stated that our mission is to provide peace and stability to this African nation, which has been torn apart by civil war. Canada sent 250 troops, 20 civilian police officers, and 10 Canadian soldiers, and helicopters and equipment for medical evacuations. Since the UN arrived on the scene in 2013, more than 150 UN peacekeepers have been killed in Mali. In Ottawa, Conservatives are critical of this Canadian deployment because the mission was not debated and brought to a vote in the House of Commons, allowing the Defense Minister to unilaterally extend or expand the mission with use of his executive power. Second, after three years and $954 million, “the phoenix has still not risen” for federal bureaucrats. The Phoenix Pay System remains broken. A total of 145,000 public civil servants (approximately 50% of the total) have outstanding pay requests. There are 51,000 employees who have been underpaid a total of $228 million. The government is now establishing timelines through 2019 to make a final decision on whether it should abandon the Phoenix. Third, NDP Party Leader Jagmeet Singh announced he will run in the bi-election in Burnaby South BC to win a seat in the House of Commons. This seat was vacated by NDP MP Kennedy Stewart who is making the jump to municipal politics. The date of the by-election is yet to be announced, although the PM is expected to call it (and at least two other by-elections) in October. Political pundits have labelled this contest “a must-win” for both Singh and the NDPs’ fortunes in the up-coming general election. Fifth, late in August, MP Maxime Bernier dropped a political bomb with his departure from the Conservative Party to start his own further-to-the-right-conservative party. The Ottawa rumour mill has former Conservative Leadership contender and TV personality Kevin O’Leary joining Bernier. Polls show as much as 17 % would consider voting for a Bernier-led Party – which would effectively divide the Conservative vote in the 2019 federal election (and likely result in the re-election of the Trudeau Liberals). Sixth, the Liberal Government’s planned carbon tax regime lost another supporter when Alberta Premier Rachel Notley announced her government would pull out of the federal tax plan on the news that the Federal Court halted the TransMountain Pipeline Project. There are now more provincial governments against the federal tax on carbon (6) than for it. Saskatchewan and Ontario are taking the federal government to court. Alberta, PEI, Newfoundland and Labrador, and New Brunswick have all now stated they will not impose the federal tax as it is on their residents. After a 12-week summer recess, Parliament resumes on Monday, September 17th with an unofficial election countdown on the Hill: there are only 13 (short) months until Canadians head to the polls. The 2018 summer plans of Niagara West MP Dean Allison are a good example of what our elected representatives organize for themselves when they are not in the Nation’s Capital. As the trade critic, Dean has committed to hosting 4-weeks of information sessions this summer to hear firsthand from Canadian businesses on how the American (and our own Canadian) tariffs will impact business and local jobs. Dean has scheduled 3-weeks of roundtables in southern Ontario and another week in the west. Dean is a Canadian representative on the inter-parliamentary Organization for Security and Cooperation in Europe (OSCE). This responsibility took him recently to Berlin, Germany to discuss Mediterranean security issues and the need for parliamentary diplomacy. Canadian MPs are active participants in the OSCE meetings where they will deliberate on issues such as arms control and human rights. In mid-August, the Conservatives have planned their Party convention in Halifax and Dean will be present to attend the many caucus functions and the party meetings. On Saturday, August 11, Dean will be hosting a public barbeque with MPP Sam Oosterhoff. Dean also has countless community events planned before he returns to resume House of Commons duties in mid-September. “It’s quite a schedule, eh,” laughed Dean. So much for the lazy, hazy days of summer for this MP – typical of hundreds of MPs’ summer plans across our country. The Canada-U.S. Trade Talks Saga is a three-part series first printed in The Niagara Independent. In Ottawa, there are two prevailing threads of thought on what has become the never-ending saga of the Canada-U.S. Trade Talks. One is rallying behind Prime Minister Trudeau and supporting the Liberal Government’s attempt to reason with an unpredictable U.S. President. The second is highly critical, suggesting that the Liberals are purposely sabotaging the negotiations for their own domestic political gains. The next three columns will review the political gamesmanship between Canada and the U.S. and assess what all the public posturing may mean for the outcome of the trade talks – and for the 2019 federal election. This is the second of a three column series on the Canada-U.S. trade talks. This column reflects on the criticism that the Liberals have purposely sabotaged the trade negotiations for their political gain in an election year. Not all are supportive of the Trudeau Government’s trade negotiation tactics with the United States. 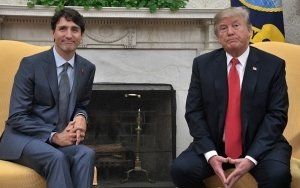 This is the third of a three column series on the Canada-U.S. trade talks, reviewing our National Leaders’ political gamesmanship and assessing what it means for the outcome of the trade talks – and for the 2019 federal election.